Saniflo, market leading producer of macerators and pumps, has introduced a comprehensive collection of shower trays to its Kinedo portfolio of trays, enclosures and shower cubicles. The new ranges will complement the Kinerock tray which was successfully launched last year. Some four further collections are now available to suit all styles, tastes and budgets. These come in a range of sizes and colours; some are cuttable and there is a range of surfaces from a luxurious stone finish to smooth white. Each carries a 10 year warranty. Positioned at the top end of the portfolio is the new Kinestone, a luxurious, lightweight and durable tray that is textured to look like slate. Oozing quality the tray is just 30mm thick can be very easily cut to size on site if required and features excellent non-slip credentails. Made from Biolith, a high density cellulite structure, the tray is highly resistant to damage and available in square and rectangular shapes with sizes between 800mm and 1800mm. Produced in six colourways that reflect the modern bathroom there is a colour to suit most décor schemes including white, grey, black, sable, anthracite and chocolate. Every last detail has been thought of in this new range such as metal gullies that match the tray colours. Kinesurf Pietra is a classic simple design that sits firmly in the middle of the tray portfolio. Lightweight and with a stunning mineral textured surface this tray is 40mm think and also cuttable. Four colours – white, black, anthracite and grey – can be teamed up with matching wall panels if required. The grainy Biocryl surface is reinforced with Biotec, a high density polymer that is also used to reinforce the ultra-flat stainless steel waste to match the tray colour. Multiple sizes in square and rectangular shapes can be specified from the compact 800mm to the walk-in1800mm. Another feature of this tray is good surface grip which offers peace of mind for users. The mid-market Kinesurf + tray range comes in square, rectangle and quadrant shapes each featuring a fine textured surface. The flexible range comes in multiple standard sizes and has the benefit of a choice of waste positions. The ultra-flat waste has a coloured metal waste grill to match the four colours of the tray – white, black, anthracite, grey – whilst each tray is 40mm thick and has a grainy Biocryl surface with Biotec reinforcement. Kinelisse is a comprehensive range of high quality contract trays featuring simple, classic looks. The slimline, low profile white gloss tray is of stone resin construction and both sturdy and durable. 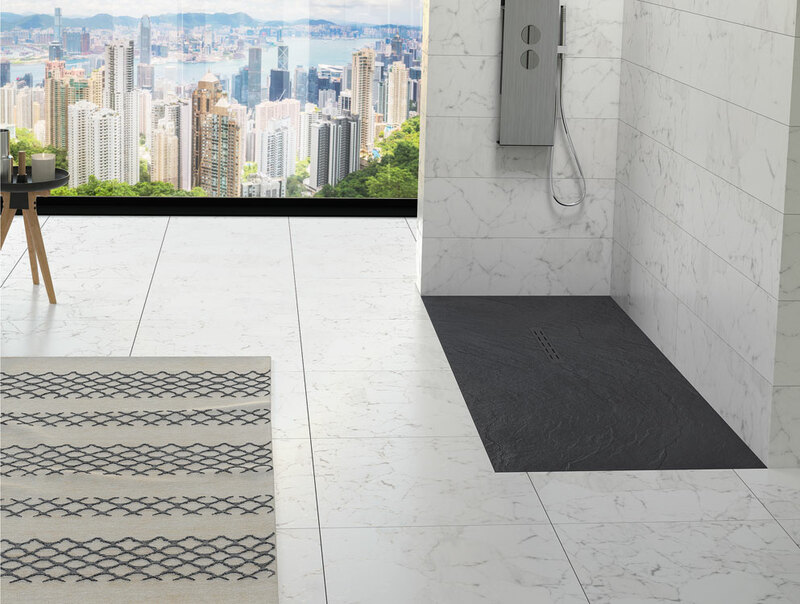 Designed to suit any style and décor of bathroom it comes in a vast range of sizes and variations from 800mm through to 1800mm in square, rectangle, quadrant and off-set. At 35mm thick the tray is well suited to the new range of Fast 2000 enclosures and bulk qualities are available for commercial and residential projects. All the new trays can be installed in raised, recessed or flat installations. A brand new Kinedo Shower Tray brochure is now available for download from www.kinedo.co.uk or hard copies can be sent by post by filling in the contact form on line.